Sony got things kicked off at IFA with the unveiling of the a slew of new Android devices including, their new flagship phone the Xperia T/TX, "midrange" offering Xperia V, entry level Xperia J and lastly the successor to their ultra unique Tablet S, the Xperia Tablet S.
Sony's Xperia Tablet S is pretty similar to existing high end tablets on the market sporting a Tegra 3 Quad Core Processor, Android 4.0 (hopefully upgraded to Android 4.1 quickly) and a 10-inch 1,280 x 800 IPS display which is a tad low in a world of Retina and 1920x1200 tablet display. The Xperia Tablet S does have a few tricks up its sleaves such as it's integrated IR blaster, turning it into a super high end universal remote, tweaks like "Guest Mode" which we presume takes advantage of Google's hidden multiuser support in the Android Operating system as well as a plethora of accesories such as stands, keyboard docks/case, etc. It's also reported to be incredible water resistant. The Xperia T/TX is Sony's new flagship for the latter part of 2012 sporting a 1.5GHz Dual Core Snapdragon S4 Processor, a 4.6-inch 1280x720 HD Reality Display with Bravia Engine, 13MP rear facing camera, NFC capabilities and Playstation certification. The Xperia V isn't Sony's new flagship but you wouldn't be able to tell from specs boasting LTE capabilities, splash proof properties, is a 1.5GHz Dual Core Snapdragon S4 Processor, a 4.3-inch 1280x720 HD display, a similar 13MP rear facing camera, NFC capabilities as well as Playstation certification. 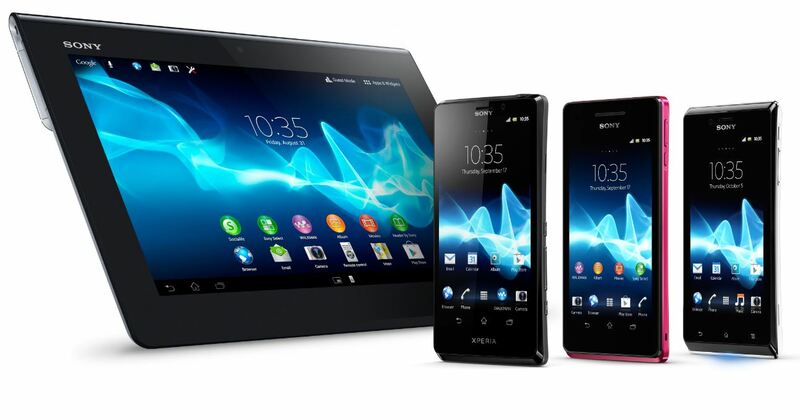 The Xperia J, is the lower end of the offerings with a 1GHz Single Core processor, 4-inch WVGA 854×480 display, and 5MP rear facing camera. All devices are sporting Android 4.0 Ice Cream Sandwich and the Xperia T/TX and V are confirmed for an upgrade to Jelly Bean Android 4.1. The way the lineup spans out is very reminiscent of the HTC One Series with the lines between midrange and high end blurring even further. No word on Canadian availability, but we expect all devices to hit Canada shelves in the near future. [Edit:] The Xperia T is confirmed for Canadian consumption but we have no solid dates just yet, we'll keep our eyes peeled for more info and let you know about more specific dates.